Want to Join the Morbid Obesity Club?? Welcome to Club Morb! I guess this a good time to talk about how many people have joined the Morbid Obesity Club or Club Morb as will become more commonly know as. It is so easy to join but so very hard to get out. The news is loaded with shocking and not so shocking statistics of the number of people and children who are now, not just obese, but MORBIDLY obese. Overweight (pre-obese) is defined as having a BMI (body mass index) of 25-30. Obese is over 30. 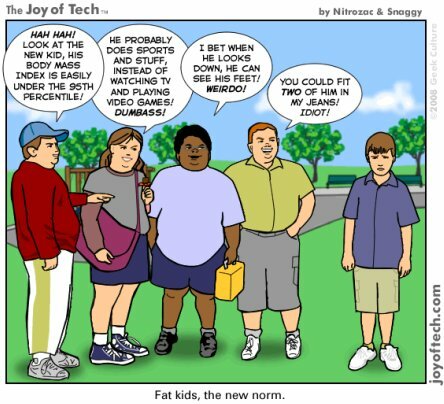 Morbid obesity is the condition of weighing one and a half or more times the ideal weight; so called because it is associated with many serious and life-threatening disorders. And we all know what “morbid” means – death!!!!!! Club Morb has far more members than Crips, Bloods, Hells Angels or Boy Scouts. In fact more than all of them put together and some members of those “clubs” are members of Club Morb. I heard the term, as it referred to me, the first time when I was 17. I was still just “obese” but was told I was on the road to ruin. They were right. Obesity and, exponentially, morbid obesity, contributes to life-shortening conditions such as: type 2 diabetes, high blood pressure, heart disease, kidney failure, sleep apnea (not enough oxygen to your brain while you sleep – insidious, isn’t it? ), certain cancers, an impaired immune system and TV-rerun season. It also contributes to osteoarthritis, sexual dysfunction (mostly in men), infertility (mostly in women), depression and the inability to find flattering clothes. It may also cause the public to ridicule and prejudge the one who is obese. I am not stupid or lazy! So how are we supposed to get out of the club? There are only two ways to get of Club Morb. Lose weight or die. Kind of frightening, isn’t it. Diet and exercise! Yep, Diet and exercise. You can even get weight loss (bariatric) surgery but you still have to do the other two things. By the way, walking is considered exercise, so isn’t as hard as you think it is. Cut out the energy (sugar, carbohydrate, fat) dense foods. You can get lots of energy from way less dense food and you and your plate will be way fuller, too. Lots of fibre!!! Eat lots of fibre and your body will thank you. It cleans out a lot of pipes including arteries. Water… most of the time you think you are hungry, you are actually dehydrated. Dana said so! Be active – notice I didn’t say exercise. If you are like me (and if you are able to join the club, you probably are), exercise is a dirty 8-letter work. Walk is a good 4-letter word and those who know me, know I like 4-letter words. Journal. Write down what, where, when and how much and you will discover things about yourself you never knew. Don’t lie, you are only lying to yourself and if you are in Club Morb, you’ve done enough of that already! Talk to your doctor! They can help and they need to keep track of the GOOD you are doing for yourself! These are some of the easiest things we can do to get out of the club. The alternative is so sad. ~ by 1fatgirlshrinking - Diane Kirby on May 29, 2012. 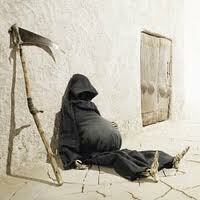 LOVE the fat Grim Reaper! That is priceless! Heya! I understand this is somewhat off-topic however I needed to ask. Does building a well-established website such as yours require a large amount of work? I am completely new to running a blog but I do write in my diary every day. I’d like to start a blog so I will be able to share my personal experience and views online. Please let me know if you have any kind of suggestions or tips for new aspiring blog owners. Appreciate it! Thanks, I owe it all to WordPress and having a lot of time on my hands. Read a lot of blogs and “borrow” ideas from them. Keep track of your tags and which links people choose on your post. Good luck.